We are very proud to receive the White Glove Award for cleanliness, friendliness and outstanding customer service for the 5th consecutive year! 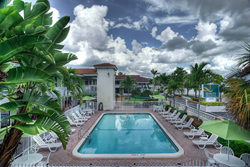 Quality Inn & Suites - Hollywood Blvd & Port Everglades Cruise Port, a budget-friendly, full-service hotel in Hollywood, Florida near Port Everglades cruise port and the Fort Lauderdale/Hollywood International Airport (FLL), has received the prestigious 2015 White Glove Award for the fifth consecutive year. The White Glove Award is a yearly award given to superior small lodging hotels that offer an exceptional level of service and amenities to their guests. Every year since 2010, the Superior Small Lodging Association (SSL) has recognized this Hollywood hotel for exceptional cleanliness, organization and customer service. "We are very proud to receive the White Glove Award yet again," stated Izzy Fintz, General Manager at Quality Inn & Suites - Hollywood Blvd & Port Everglades Cruise Port. "To be given this prestigious award five years in a row is a testament to our friendly, hardworking staff and exceptional services. We are continuing to go above and beyond for our guests, and continue to provide superior services and amenities that our visitors have come to expect." The Superior Small Lodging Association (SSL) is a non-profit organization comprised of small hotels, inns, bed & breakfasts and cottages. Quality Inn & Suites - Hollywood Blvd & Port Everglades Cruise Port is a budget-friendly, full-service pet-friendly Hollywood, Florida hotel in close proximity to popular South Florida tourist destinations such as Hollywood Beaches, Sawgrass Mills shopping center, Fort Lauderdale's Port Everglades cruise port and the Fort Lauderdale/Hollywood International Airport (FLL). Located right on Hollywood Blvd, just minutes from the beach, this Hollywood hotel is a perfect destination for families and cruise vacationers. Guest services include complimentary hot breakfast, heated outdoor pool, whirlpool tub suites and Wi-Fi. Shuttle transportation to the airport and cruise port and long-term cruise parking are also available. For more information, visit http://www.hotelhollywoodfl.com or follow the hotel on Facebook. For best deals and optimal service, please book directly with the hotel. Quality Inn & Suites - Hollywood Blvd & Port Everglades Cruise Port is a member of Choice Hotels International, Inc.® (NYSE: CHH).